Sephora’s annual holiday sale is coming soon! This is the biggest discount that Sephora offers all year (they have a similar sale in the spring but that one is 15% off) at 20% off for VIB (those who have spent $350+ in one calendar year) and VIB Rouge members (those who have spent $1000+ in 1 calendar year) on all purchases. VIB Rouges will get 20% off with code 20ROUGE both online and in stores Friday November 4th- Monday November 7th, 2016. VIBs will receive 20% off their orders with code 20VIB both online and in stores Friday November 11th-Monday November 14th, 2016. As always, don’t forget to use Ebates for an extra 4% cash back it will help you justify these insane prices you’re about to see. The sale is not expected to be available for Beauty Insiders. 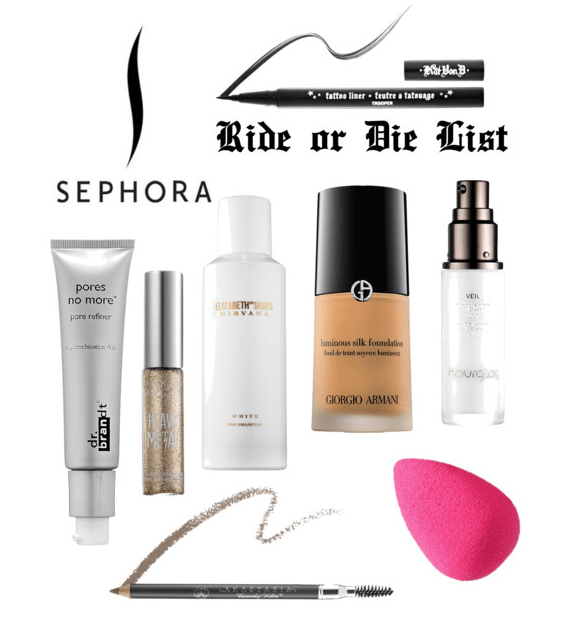 My Sephora all time faves aka Ride or Die list! I use these products consistently (some of them for years), have repurchased them despite my insane makeup/beauty product collection, and continue to come back to them time after time because they’re just that good! This year I have also included whether the item is cruelty free and if it’s made in the USA. Giorgio Armani Luminous Silk Foundation $64 I’m in shade 4.5- light neutral. I first splurged on this foundation 3.5 years ago and just recently purchased a second bottle because I love it so much. I have oily/combination skin and like a full-glam medium to full coverage and this foundation gives me that, a blurred effect, and a dewy finish that’s not too oily. This is my go to date-night foundation because it makes you look like an enhanced version of your natural self. Elizabeth and James Nirvana White Dry Shampoo $28 (Cruelty Free, Made in USA) This price is ridiculous, but this was my “special occasion” dry shampoo (I just use Batiste from the drug store on normal days) and it just smells so incredible and works so well it’s a fantastic treat yoself item that I think I need to go ahead and re-purchase this year. I own the perfume of this and 2 travel sized roller balls of it, but the dry shampoo’s scent is so strong it lasts for a long time and it’s just lovely. Just a warning- it does have a bit of a white cast so be careful not to use too much if you have dark hair. Hourglass Veil Mineral Primer $54 (Cruelty Free, Made in USA) There is a travel version of this that I purchased a few times before realizing that this primer is a staple of mine and I might as well pony up and buy the big boy. I wear this primer daily as my moisturizer/SPF/primer both with and without makeup. It’s so light and silky it just feels great. It does help control my oil a little bit and minimizes the appearance of pores, but they definitely aren’t disappearing. Dr. Brandt Skincare pores no more pore refiner primer $45 (Made in USA) Because I shop so much I get TONS of beauty product samples, but it’s very rare for me to buy the full-sized item after trying a sample. This product was different. Again this is a daily necessity for me both with and without makeup. It honestly does fill in pores and blurs them as well as absorbs excess oil. You look slightly more matte after applying it and your skin looks smother. If you have not tried this product before do yourself a favor and get a sample next time you’re at Sephora. Kat Von D Tattoo Liner in Trooper $20 (Cruelty Free) Luckily because I get so many samples I haven’t had to purchase the full size of this item yet, but I really love it and friends have tried it and immediately went to purchase it because it’s that good. This is a liquid eyeliner with a brush tip that has a very tiny point so you can make an incredibly thin, controlled line every time. It also lasts forever and looks great. beautyblender the original beautyblender $20 (Cruelty Free, Made in USA) I wish this pricey sponge was just all hype because then I wouldn’t have purchased at least 6 already. Unfortunately, this sponge is one of a kind and blends makeup flawlessly. I use it damp daily to apply foundation and blend concealer and when it’s still wet with both I dip it into loose powder and set under my eyes/bake for a super flawless finish. Anastasia Beverly Hills Perfect Brow Pencil in Taupe $23 (Cruelty Free, Made in USA) This is a daily must have. I also love the Brow Wiz, but I find it doesn’t last long enough for me to justify the price, and the Dip Brow, but find it’s too easy to go overboard and look like Eugene Levy so I’ve relegated it to heavy beat (full makeup look) days. Urban Decay Heavy Metal Glitter Eyeliner $20 (Cruelty Free) Is this an everyday product for me? I wish. I do, however, use it in almost every single dramatic makeup look I do because it just adds an extra pop that’s so pretty. Gold, glitter, drama, what’s not to love? What are your Ride or Die or must-have products from Sephora?